Bake breadsticks without twisting as directed on can. Cool completely. Meanwhile, in 1-quart saucepan, heat cream over medium-low heat. Stir in sugar until dissolved. Remove from heat; cool. Heat oven to 350°F. Add eggs to sweetened cream; beat lightly with whisk. With small knife, score baked breadsticks lengthwise (make sure you don't cut the breadsticks in two, just a little on the top). Dip each breadstick into egg-cream mixture, turning to coat both sides and allowing breadstick to soak up some of the mixture. Place on ungreased cookie sheet. Once all breadsticks are stuffed, bake 10 minutes. Serve warm. For a faster version, bake the breadsticks the night before. 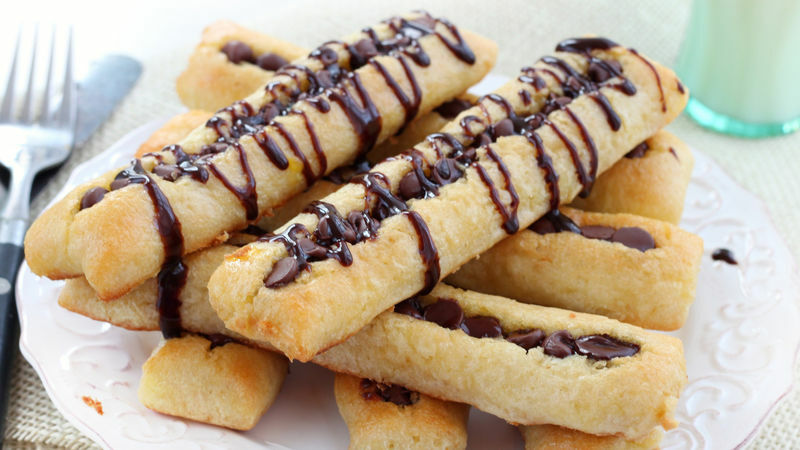 Serve the breadsticks with chocolate or maple syrup.